With My Psychology, intro psych is intro me. My Psychology is a uniquely personal introduction to the science of psychology. 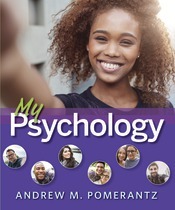 Driven by easy-to-understand writing and examples centered on the everyday experiences common to college students, this innovative project shows students how the essential concepts of psychology are relevant to their lives. features come fully integrated in an online learning environment organized around learning outcomes and driven by the LearningCurve adaptive quizzing system, which gives each student a unique study plan and real-time feedback.